500ml bottle. Best before 12/11. 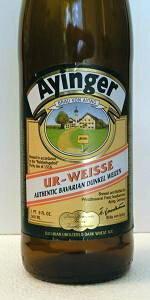 It pours a darker hefeweizen color, not quite as dark as a typical dunkelweizen, it is a ur-weisse (traditional/pre-modern weisse) after all. It is cloudy with a foamy, creamy-looking off-white head. The smell is dominated by bananas with just a hint of clove and wheat. The flavor continues the banana theme. This is just a banana bomb and then some. There is some clove , some apple, and some lemon, yes but the dominant yeast flavor here is banana. There isn’t much in the way of roasted malt in the taste. There is a slight bit of hops that round it out. This one is delicous x 10, it is a hot day in Munich today and you would be hard-pressed to find a better thirst-quencher. Screw the strawberry-lime-derpaderp, just let the yeast do it’s thing and you’ll get this.